This post has been a long time coming, it has just taken me a moment to sit down and put it together. I wanted to share what I do for back smoothing. I used this wrap dress because although wrap dress looks great on just about anyone they do tend to hug the back area. Personally, when wearing a something of a jersey fabric like this, I would normally wear something to smooth my back. 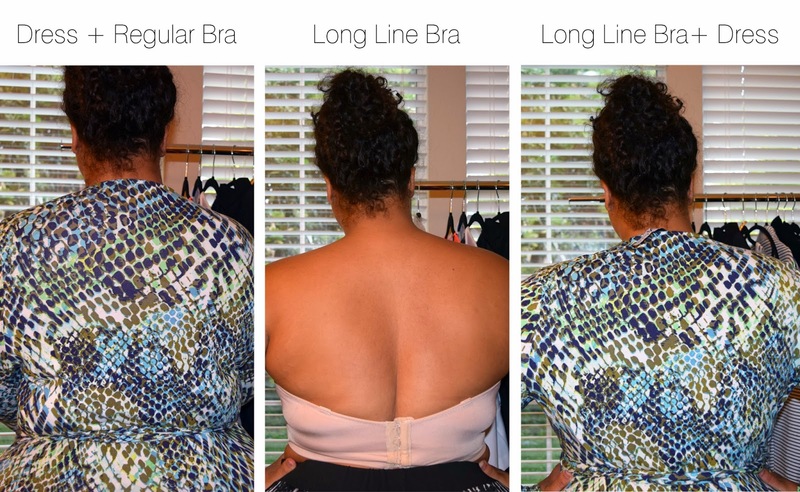 In this post I'm reviewing the back smoothers I regularly use: A long line bra, the Butterfly Bra, and HookedUp Shapewear. Style Notes: Prints like this on they MYNT dress are excellent for camouflaging areas that we may want to camouflage. I shot this with my assistant and because of the print we had to shoot it a couple of times, so the back wouldn't look smooth. It wasn't because my back is smooth it was because of the print. My bra size is a 40D. I'm a small D and most of my life I was a 36B or 38C and only got a bust because of pushing side fat into my cup. LOL. I love long line bras for strapless purposes. The wider band holds in place long, so I'm not tugging on it on the whole night. 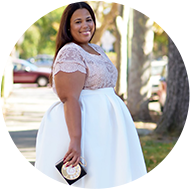 You could also wearing your long line bra on top of your shapewear, so that you have two pieces and easy bathroom access. This bra is from Lane Bryant and they cater to sizes up to a H. Find it here. This is probably my favorite technique and the one I wear the most. I've heard some of you say that this bra is hard to get into. The first time I tried it I had a little trouble, but if you snap the top part first then the rest is easy. The Butterfly bra comes with both straps and strapless. I love the strapless, but it tends to cut you across the bust, so there is a dent in your chest area. I've personally noticed this from photos. So if I'm doing strapless, I'll go with the long line, but if I can wear straps I'm going with the Butterfly Bra. This bra is super inexpensive from Ashley Stewart. The only downfall is that it doesn't cater to anything over a DDD. You can find it here. This probably yields the best results in shaping, in my opinion. This works with the bra you already have, so no bust limitations. The only thing is, that in my case, that it's not very bathroom friendly. If I'm wearing this, I'm not having a cocktail. LOL. There is a large hole in the shapewear for the bathroom, I've just never been good at using those holes (my thighs are too big), but some of you have talents and thighs that I do not possess. This shapewear is long in the torso so it comes up nice and high and I wear this daily. On my day to day, I don't hook it into my bra, but when I ready to bring out the big guns (i.e. body con dresses) that's when I hook in and don't drink. LOL. Find it here and be sure to check the size chart before ordering. Disclaimer: Please keep in mind, if back smoothing isn't for you that is perfectly fine, but this is what I do and I am sharing for those who want to know.